The idea of the replacement level player is one of the most important concepts in sports analytics. While not strictly necessary to do any basic player comparisons, the value of the replacement level lies in providing a baseline below which a professional player should not perform. After all, if a player is performing below replacement level, we should listen to the stats and do exactly what they tell us to: replace him with almost any other player. In hockey though defining replacement level can be a difficult task. Part of that stems from the fact that we currently don’t have exact methods of rating player’s individual contributions. We can say which players generally perform well when they’re on the ice, and we can estimate how a player’s team performs with and without him, but distilling all the information we have down to an opinion about a player’s value is currently more art than science. Hockey is a complex game with many moving parts and because of that creating an aggregation method for all the data we gather is a complex task. The easiest way to tackle a problem that’s so daunting is to start breaking it down into smaller pieces, and finding ways to isolate and identify individual contributions within those pieces. Faceoffs are an easy place to start breaking things down – they can be generally modelled as a competition between two individuals (ignoring the few wingers/defencemen who have a significant impact on faceoff percentage), the outcome of interest is binary, and we’re significantly less likely to observe scorer bias that we’d need to correct for. Because of all these facts, a player’s faceoff percentage can (with sufficient sample size of course), be viewed as an individual ability, and as such we can define the minimum level that we’d expect a player to perform at in order for us to keep sending him out to take draws. The trick with faceoffs is determining a way to define replacement level performance. In most cases, our view of replacement level is driven by what’s available in the market for little or no cost. But in this case we’re going to look at it a different way – because team’s rarely make personnel decisions based on faceoff ability alone (or rather, they shouldn’t make personnel decisions based on faceoff ability alone), looking to the minors or the mid-season UFA pool won’t necessarily give us a usable measurement for replacement level. Instead of taking a market-based approach, we can create a reasonable estimate of a replacement level player by looking at the faceoff performance of players who have earned a regular NHL role but who aren’t generally the primary option in the faceoff circle when they’re on the ice. If we look at the aggregate faceoff performance of this group of players we should get a good sense of how bad an everyday centre would need to be on the draw for us to consider removing him from the faceoff circle entirely. With this as our deciding metric, we now need to figure out where we should draw the line between our true centers and our replacement players. This isn’t a trivial decision either, as our definition of replacement level varies based on where we set the cut-off point. The choice that we make is clearly an important one, so it’s worth putting some thought into what an appropriate level is. One way we can add a bit of structure to our decision is to plot the percentage of all faceoffs taken by everyday centers against our cutoff point. 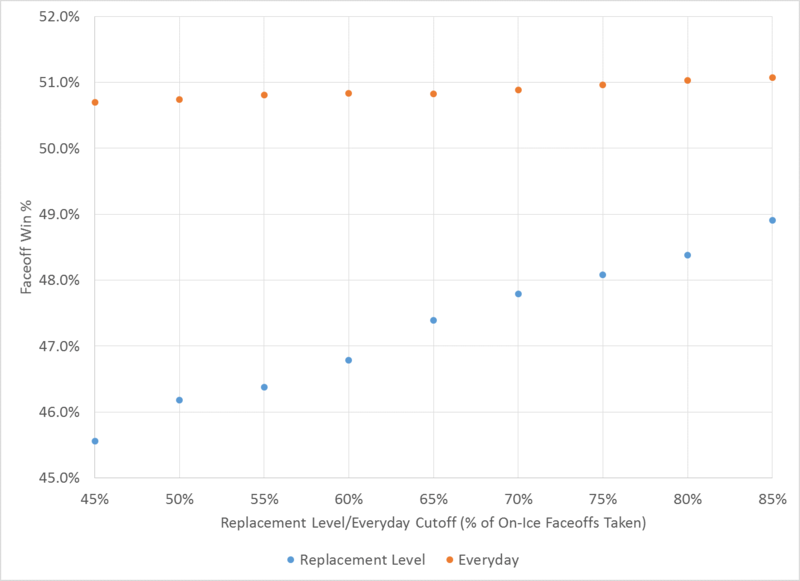 What the chart above shows is that up until we set the replacement level cutoff to 87% or so, the majority of the faceoffs will be taken by everyday centers. 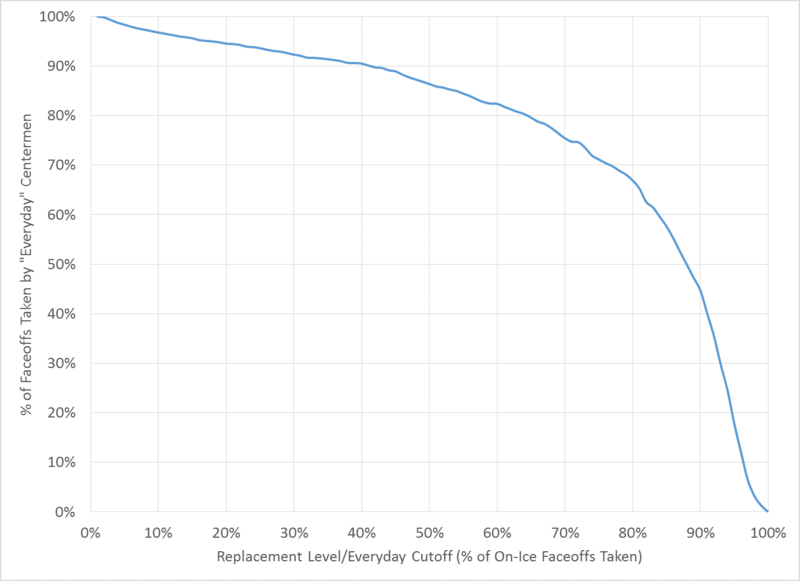 It’s likely, however, that we’d want more than 50% of the faceoffs to be taken by everyday centers – personally, the number 80% seems like a reasonable figure, which, if we refer again to the graph above, would occur when we set the replacement level/everyday cutoff to about 65%. We can validate that our choice is reasonable by looking at the percentage of players qualifying as everyday centers versus various levels of the cutoff percentage. If we’re accurately capturing most everyday centers using a cutoff of 65%, we should see that roughly 1 in 3 forwards qualify using our definition, which fortunately we do. 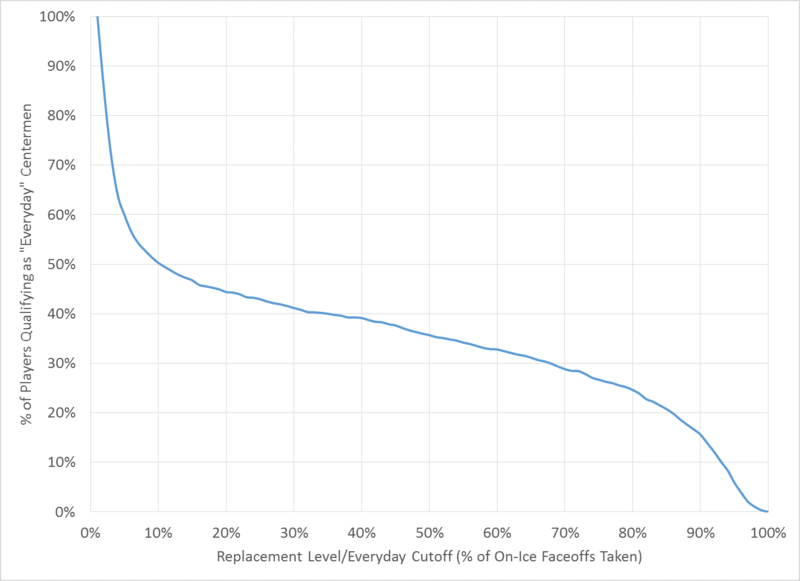 A cutoff of 65% provides a replacement level faceoff win percentage of 47.4%, calculated as the total number of faceoffs won by replacement level faceoff-takers (% of on-ice faceoffs taken < 65%) divided by the total number of faceoffs taken by replacement level faceoff-takers. Similarly, a cutoff of 65% means that everyday centers tend to win about 50.8% of the faceoffs they take which is encouraging – we’d expect the guys doing this the most to be better than average, although not drastically so. With our replacement level defined we can look at which players have been bad enough in the faceoff circle that we should never let them near it again. The table below lists all the everyday centers (again, those who take more than 65% of the draws when they’re on the ice) who have posted more than 2 seasons of below replacement level play since 2008-2009. The good news: there aren’t that many players on this list, which means that coaches in the league are generally recognizing when a player isn’t performing on the draw. But at the same time, the fact that there are even a few players here who have put up 4 or more years of below replacement play is also a little mind-boggling: why has Mike Ribeiro been allowed to take 4140 faceoffs since 2008-09 when he’s only won 1850 of them? I can understand giving a player a pass on a bad year or two, but it’s somewhat odd that no one has considered taking Ribeiro out of the faceoff circle after that many years of futility. It’s likely that some of the names on the list are getting a pass because of their talents elsewhere on the rink – I’m sure that the faceoff abilities of Steven Stamkos and Ryan Getzlaf are of less concern to Jon Cooper and Bruce Boudreau than their ability to drive play after it’s started up. Others are possibly just being given time to grow into the game (RNH, for example). But it still strikes me as strange that teams wouldn’t try someone else out when they see seasons as bad as the guys above have put up, particularly given the fact that faceoff performance alone could contribute up to 1 win at the extremes. Knowing where the replacement level sits is key in making decisions like this – a player winning 45% of the draws might not seem bad if they’re contributing in other ways, but when you know that you could expect to win 2% more faceoffs with just about anyone else in the faceoff circle, it starts to become obvious the path you should take. While the value of faceoff performance is generally overemphasized, it’s also something that shouldn’t be ignored either – every marginal gain you can make will eventually start to add up. And when there’s clear evidence to support these changes as there is in many cases here, there’s no reason not to make that change – in a lot of cases, you literally could not do any worse.